The dramatic video showed her falling out of the vehicle Monday near Tampa before the driver got out and dragged her back in. Detectives in Florida have found a woman safe after she was seen on a surveillance video falling from a moving SUV, officials said Tuesday. The 21-year-old woman had suffered road rash in the Monday afternoon fall but had not sought medical attention, a Hillsborough County Sheriff's Office news release said. She told investigators that she fell out after leaning against a previously damaged door. The woman had been riding with her boyfriend, his sister and the sister's 1-year-old son, the release said. They told police they had just left a nearby Walmart. 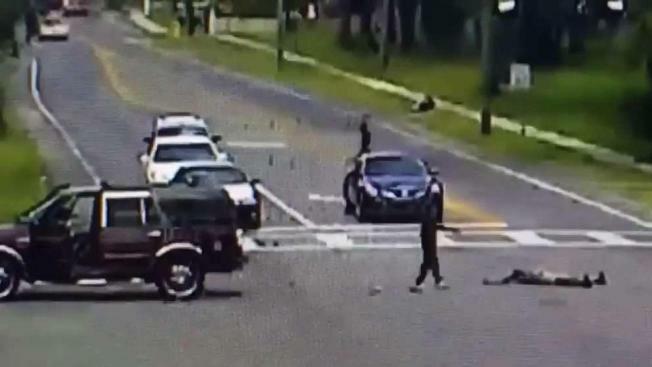 The Monday afternoon incident was captured on video at an intersection near the University of South Florida in Tampa. The woman appeared to be unconscious after the fall, which prompted the search for her. The video was shared by the sheriff's office in hopes of getting the public's help in finding the woman. She was flat on her back on the road when the driver, later identified as the woman's boyfriend, got out, picked her up and carried her back to the SUV. He then drove away. Numerous cars were at the intersection, and there were several people walking and biking along the sidewalk at the time. Detectives have categorized the case as an accidental injury. No charges are expected.